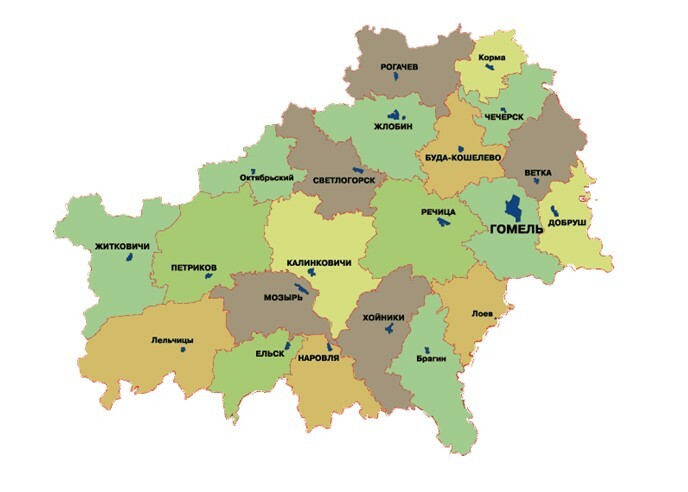 The Gomel region is located in the southeast of Belarus adjoining in the east with Russia and in the south with Ukraine. Through its territory pass railway transport highways of republican and interstate value. Large railway junctions are Gomel, Zhlobin, Kalincovichy. Gomel is located on crossing of railways Bahmach-Vilnius, Bryansk - Brest. The railroad lines to Moscow, Saint Petersburg, Kiev, Minsk, Brest depart from the city. Through Gomel passes the transport euro corridor. The city is connected by airlines to Moscow, Saint-Petersburg, Kiev and many other cities of Russia, Ukraine, Belarus. Navigation is carried out over Pripyat, Dnieper and Berezina. The Gomel university, various institutes, theatres, regional theatre of dolls, the region museum, the planetarium functions here. The palace-park ensemble, the St. Peter and Paul church of the XVIII c and the other historical monuments were saved in the city. On territory of the region is located the National Park Prityatski where practically in a photogenic condition unique landscapes of the Belarusian Polesye were saved. Besides the Polesye radiation-ecological reserve functions here. The purpose of its creation became preservation in a natural condition of the natural complexes with their unique landscape structure, undergone to influence of radioactive pollution after Chernobyl accident, and also complex studying and radiobiological monitoring.